The Unlock! 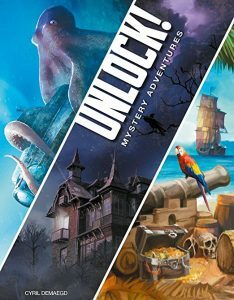 Mystery Adventures box comes with a tutorial adventure and three full length adventures of increasing difficulty. The themes of the three adventures look nicely varied, although I hear that there’s not much narrative flow behind them. A good story can really help an Escape Room, but can also detract from the experience if the puzzles are inconsistent with the plot, so I remain open-minded about what’s to come. To play the game, you have to download an app which serves as a timer, provides an interface for interactive machines you might encounter during the game, and receives the final “unlock” code to finish the game and get your final score. The app is simple to use and means that the game components are just a deck of cards. Some of the cards have numbers on them which you type into the app to access the interactive machine. I think it’s a really nice idea. Some other escape games come with all sorts of real-life widgets and code wheels. These look fun, but push the price up. Also, nothing is destroyed or damaged by playing Unlock!, so you can pass the game on to a friend once you’ve played it yourself. The app interface means that it’s possible for the developer to publish new sets of cards for players to print out themselves. Indeed, that’s exactly what they’ve done! There’s a tutorial and four free demo adventures that you can try out before investing in the full game. If you like them then as well as the Mystery Adventures set that I’ve picked up, there’s the original Escape Adventures, and a forthcoming Secret Adventures set. To play the free adventures, you first need to download the app. It’s available here for Android and here for iPhone. Rules (PDF). These are the old rules before the interactive machine function was added to the app. Tutorial (PDF) (10 minutes, very easy). 5th Avenue (PDF) (30 minutes, easy). The Elite (ZIP) (60 minutes, medium). These next two adventures are more recent and use the “interactive machine” function on the app. To use a machine, identified by a green cog on a card, tap the “machine” button in the app and type in the number from the card. Be careful, trying to use a machine before you understand how it works can lose you time or give you penalties. Doo-Arann’s Dungeon (PDF) (30 minutes, easy). The Temple of Ra (PDF) (60 minutes, hard).